A public speaker, educator and communicator has released the first volume of her debut creative collection of poetry, which wraps words around life events and delves into the emotional complexity of the human experience through short, candid insights. 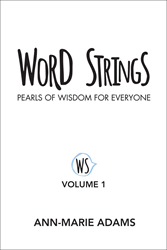 In “Word Strings: Pearls of Wisdom for Everyone,” skilled storyteller Ann-Marie Adams frames relatable life concepts, such as aging, leadership and parenthood, with comforting narrative that reflects upon the struggles and joys of living while also addressing modern societal attitudes and issues. A potpourri of every-day wisdom, bite-size quotations and sharable moments of clarity, “Word Strings” provides readers with a simple, unfettered means of expression that encourages them to interpret and apply the book’s messages in their own way and explores both life’s darkness and whimsy. Ann-Marie Adams is a skilled communicator, educator and writer with nearly two decades of experience in public engagement. A natural storyteller, Adams is the author of poetry collection “Word Strings” and illustration series “Aquabet” and is an adjunct professor at Ithaca College’s Roy H. Park School of Communications. She currently splits her time among the Lowcountry region of South Carolina, the Finger Lakes area of New York and East Tennessee to teach, write and porch sit. To learn more, please visit http://www.wordstringsbook.com.